A new study by researchers at the University of Cambridge has shown that the dusky dottyback, a small predatory reef fish, can change the colour of its body to imitate a variety of other reef fish species, allowing the dottyback to sneak up undetected and eat their young. Its Latin name, Pseudochromis, means false damselfish – giving clue to its mimicry abilities. The dottyback also uses its colour-changing abilities to hide from larger predators by colour-matching to the background of its habitat – disappearing into the scenery with its camouflage. While using mimicry to hunt or hide from other species is commonplace in nature – from cuckoos to cuttlefish – scientists point out that if the same physical deception is encountered too frequently, species on the receiving end become more vigilant and develop tactics to mitigate the mimics. The dottyback, however, is able to colour-morph depending on the particular colour of the surrounding species it is currently hunting: different types of damselfish being a popular target. Scientists say that this flexibility of physical mimicry makes it much harder for the dottyback’s prey to develop detection strategies and avoid getting eaten. Dottybacks are generally solitary and highly territorial predators of around eight centimetres in length, commonly found in Indo-Pacific coral reefs. While dottybacks can vary their colouration from pink to grey, the researchers focused on two colour ‘morphs’ – yellow and brown – that both occur on the reefs surrounding Lizard Island, off the coast of north-east Australia. This is because the area has populations of both yellow and brown damselfish, and habitat consisting of live coral and dead coral ‘rubble’. The scientists built their own simulated reef outcrops comprising both live coral and rubble, and stocked them with either yellow or brown damselfish. 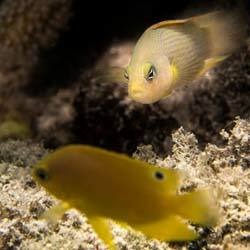 When released into reefs with damselfish of the opposite colour, scientists found the dottybacks (Pseudochromis fuscus) would change from yellow to brown or vice versa over around two weeks. Anatomical study of dottyback skin cells revealed that while the level of ‘chromatophores’ – pigment-containing cells that reflect light – remain constant, the ratio of yellow pigment cells to black pigment cells shifts to move the dottyback from yellow to brown or back again. The team conducted lab experiments with adult and juvenile damselfish to test whether this colour change affects dottyback hunting success. They found that once the dottyback matched the colour of the damselfish, they were up to three times more successful at capturing juvenile damselfish. “This is the first time that an animal has been found to be able to morph between different guises in order to deceive different species, making the dottyback a pretty crafty little fish” says Dr William Feeney, co-author of the study from the University of Cambridge’s Department of Zoology. Photo credits: Christopher E Mirbach, Justin Marshall.